Form DD-214, Coastst Guard Distinguished Service Medal Certificate, Coastst Guard Distinguished Service Medal reflecting registrant’s name, or letter from Veterans Administration. Person applying must be/or have been a veteran with the US Armed Forces. Only one (1) free tag issued – motorcycle. Upon the death of the veteran, the surviving spouse may request/retain the tag provided they do not remarry. 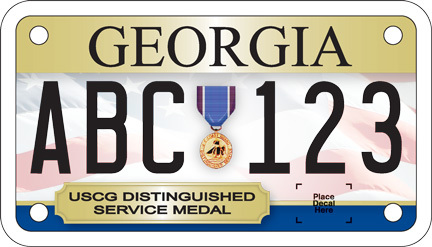 To request/retain the tag, a certified copy of the veteran death certificate and Marriage License is required. Only one tag issued.